The concept of Open Data is about making data held by public bodies available and easily accessible online for reuse and redistribution. As public bodies have progressed in areas like eGovernment and data analytics, the potential of data and, in particular, Open Data to help deliver economic, social and democratic benefits has become clearer. The data.gov.ie portal brings these datasets together in a single searchable website. MeathHeritage.com now features as a showcase on data.gov.ie. what3words is a global grid of 57 trillion 3mx3m squares. Each square has a 3 word address that can be communicated quickly, easily and with no ambiguity. MeathHeritage.com turns the locations of the National Monuments in Meath into these 3 word addresses. Using words means non-technical people can accurately find any location and communicate it more quickly, more easily and with less ambiguity than any other system like street addresses, postcodes, latitude & longitude or mobile short-links. 46 organisations and businesses have been longlisted for the Awards. “The awards – part of the World Responsible Tourism Awards family – are the most rigorously judged responsible tourism awards in the world. We are delighted to announce that www.meathheritage.com has made it through the technical stages of the Eir Spiders Awards in both the Education and the Digital Geography and Location based services categories. We are giving away two Annual Heritage Cards! These Heritage cards give holders free access to all OPW managed sites for one year. To win: Tell us what your favourite National Monument is in your area. Winner annouced 7th August 5pm. The Logainm Placename Project was initiated in 2007. The main aim of the project is to map and provide in English and Irish the placenames of Ireland. These placenames are categorised as either Administrative Counties, Baronies, Civil Parishes, Towns, Townlands, Electoral Divisions and Provinces. Over the years the project has gone through a number of phases. This has resulted in a number of excellent features. One of which is the sound recordings of each of the placenames. The recordings pronounce each of the placenames in English and Irish – a hugely valuable resource from an educational point of view. 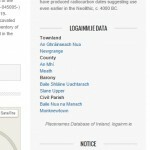 The project is now in phase V. The completion of the Linked Logainm project has allowed MeathHeritage to retrieve placename information in both English and Irish for some of the National Monuments. 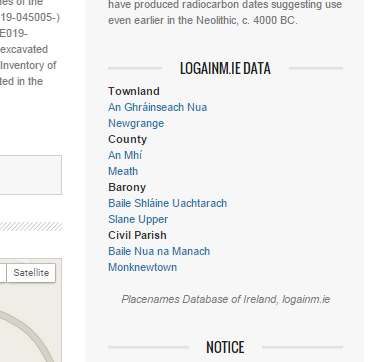 To date, the Logainm placename project has translated over 60% of the placenames in Meath. For this reason, some of the placenames information might not be available for some monuments.